I was thrilled when the super-creative and talented cookiers, Hani (Haniela's) and Mike (SemiSweet) invited me to this virtual baby shower for Jennifer, but as I later prepared the cookies, my mind had somehow switched from geek to nerd. As I was putting this post together and read the particulars again, I realized it stated a "geeky" shower theme, not a "nerdy"one?!? I was sort of in a panic because just recently a co-worker attempted to explain to me the nerd vs. geek distinction. I have to admit I had a hard time distinguishing the difference?!? It's a fine line, I tell ya! I finally looked up the definition of "geek" in Merriam-Webster. I was a bit relieved when it listed "nerd" as one of its synonyms:) Whew! They were directly inspired by adorable cookies from Sugarbelle, and Make Bake Celebrate! Their cookies were "chocolate chip", but I thought that colorful sprinkles would be more fitting for a baby girl's shower. Jennifer, With these cookies comes my sincere CONGRATULATIONS on the birth of your sweet baby girl! I wish you nothing but the best as you begin your new adventures as a family of three! I hope you enjoy your baby shower and feel the cookie love! 2. Roll out the sugar cookie dough to your desired thickness (I usually roll it out about 3/8-inch thick). 3. Cut out cookies with round cutter (mine was 2.5-inches) and place on baking sheet. 4. Bake according to recipe. 5. Add a drop or two of ivory coloring to some of the royal icing. 6. With a #3 tip outline and fill the cookies with the ivory icing. 7. Wile the icing is still wet, gently place the eyeglasses transfer on the cookie. 8. 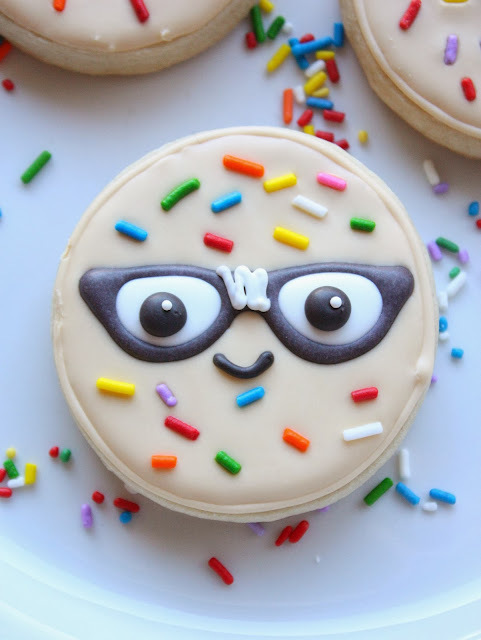 Immediately following the eyeglasses, place the jimmies on each cookie with the tweezers(be sure and leave an empty spot for the smile). 9. After about an hour, I went ahead and added the black tinted royal icing for the eye detail and then dropped in the white sprinkle while the black was still wet. Let cookies dry completely, overnight is best. Be SURE and visit the other guests at the shower and their geeky baby shower cookies! 2. ROBOT GIRL COOKIES by Michelle from Make Me Cake.Me. These are adorable...I wish I knew someone having a baby shower! I LOVE LOVE LOVE these little cuties! And the placement of each sprinkle is perfection! Sue, these are just too adorable! I love these cookies! The glasses, the sprinkles & the expression. Too great to eat! A…flippin'…dorable! I love them so much, Sue! 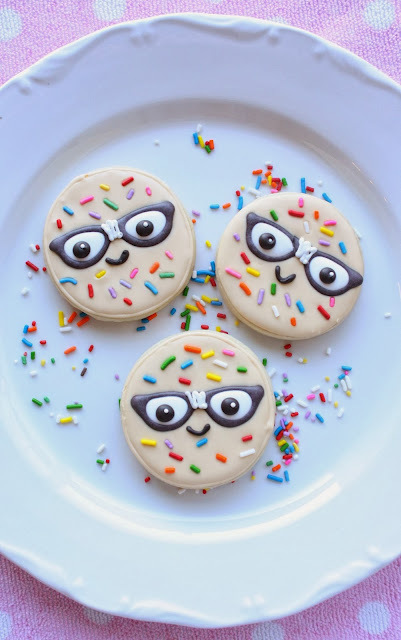 The sprinkles make them extra girlie and the glasses are perfect! I love SB's glasses transfers, too, btw. I've got a cookie coming up with them. Anywho, awesome job! And I thought your Mini Santa and Elves were cute. These are even cuter! Love Jennifer and her blog. So happy for her and her husband with the safe arrival of their beautiful little girl. We both love anything geek related and your geeky sugar cookies are just adorable! The glasses are my favorite part, but the sprinkles add a nice touch too. So true! 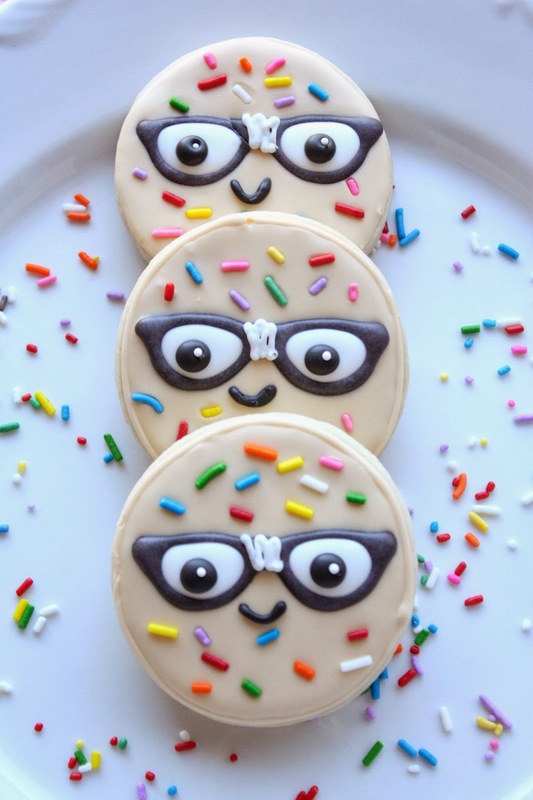 There is a fine line between Nerd and Geek, but you nail it with these cookies. 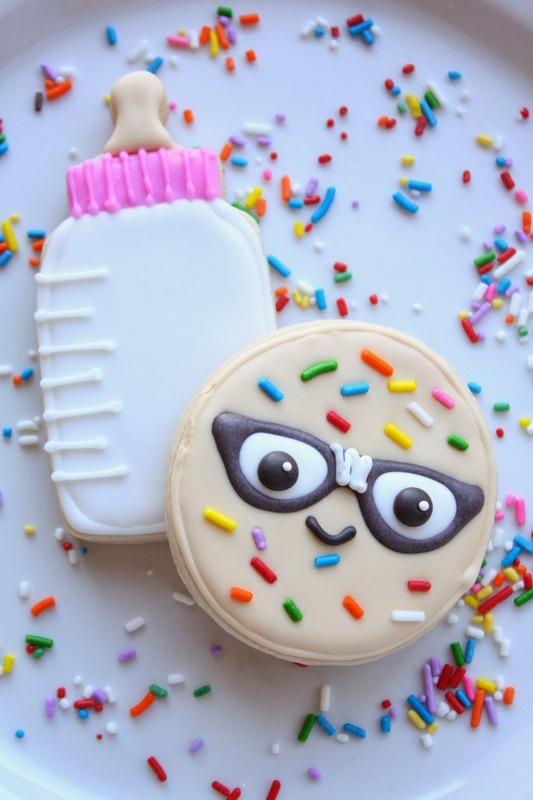 :) Love your baby bottle of milk, which compliments your sprinkle cookie perfectly! Thanks so much, Sue, for joining up and sharing your talents with us for this virtual baby shower!! Geek, nerd - it's all good! Sue, I love your sweet, nerdy cookies :) Just awesome! Thank you so much for honoring our baby girl! Piping these tiny glasses with frosting must have been a challenge but the whole "look" really came together nicely! 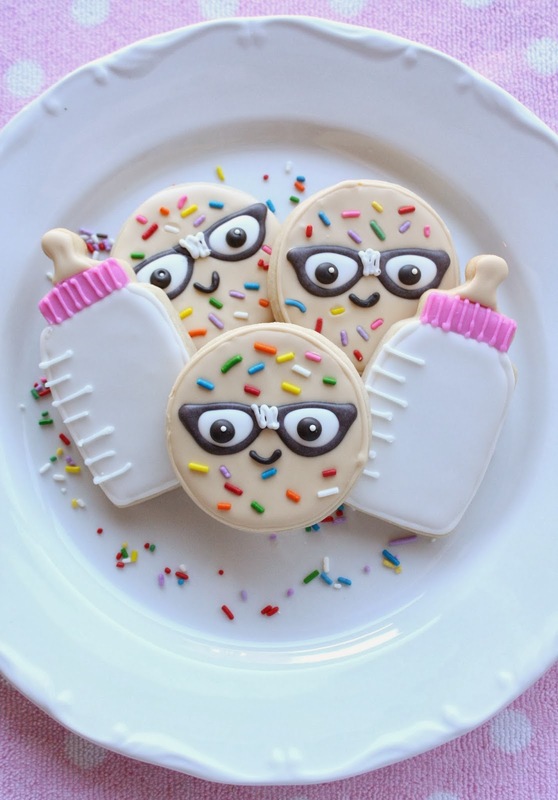 These are so adorable, love the sprinkles all over! Your transfers turned out perfect! I adore these cookies! I don't know what it is about cute little faces and glasses on cookies that make my heart skip a beat!! Thesea re seriously amazing!! I think that in order to create such cookies one needs to be not only a good cooker, but also a very creative painter, because the ability to decorate cookies this way demands a lot of skills.